The ultimate dessert decadence. Chocolate, Oreos, and whipped cream: who could ask for more? This rich, creamy dessert is the perfect after-dinner treat, combining the idea of ice cream and pie in one. 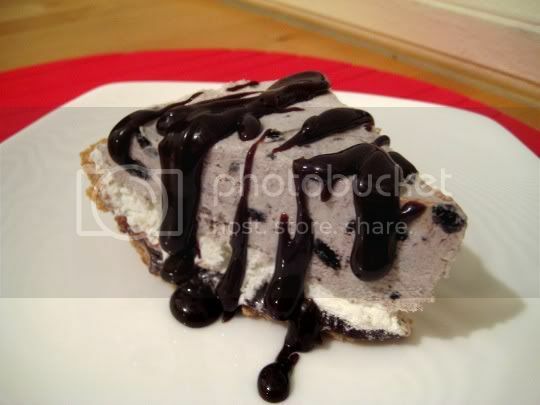 Easy to make (but be prepared, this needs to freeze until firm...probably overnight is best) and with only a few ingredients needed, this is a layered pie with hot fudge, Cool Whip, and Oreo pudding...and more hot fudge drizzled on top...all in a graham cracker crust. A few bites of this cold, frozen pie will give you an immediate sugar rush, and it is surprisingly rich. I think an Oreo crust would have been a little better and more complementary for this pie, but the graham cracker crust gives sort of a waffle cone flavor if we're thinking "ice cream shop." Then again, the graham cracker is amazing with the hot fudge and Cool Whip, making this almost a smores-like delicacy. Make again? Yes, but for a crowd...this is too rich to keep eating by yourself!